Triple–bottom-line outcomes from resource management and conservation, where conservation goals and equity in social outcomes are maximized while overall costs are minimized, remain a highly sought-after ideal. 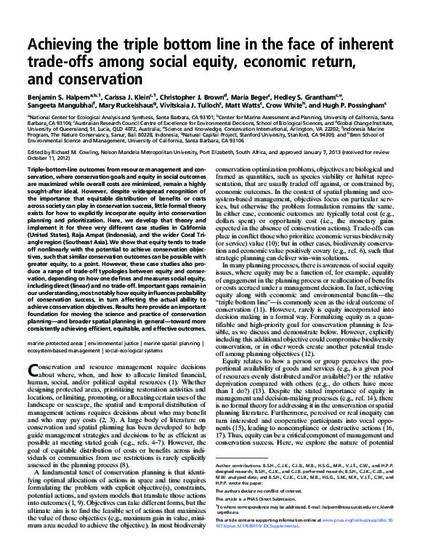 However, despite widespread recognition of the importance that equitable distribution of benefits or costs across society can play in conservation success, little formal theory exists for how to explicitly incorporate equity into conservation planning and prioritization. Here, we develop that theory and implement it for three very different case studies in California (United States), Raja Ampat (Indonesia), and the wider Coral Triangle region (Southeast Asia). We show that equity tends to trade off nonlinearly with the potential to achieve conservation objectives, such that similar conservation outcomes can be possible with greater equity, to a point. However, these case studies also produce a range of trade-off typologies between equity and conservation, depending on how one defines and measures social equity, including direct (linear) and no trade-off. Important gaps remain in our understanding, most notably how equity influences probability of conservation success, in turn affecting the actual ability to achieve conservation objectives. Results here provide an important foundation for moving the science and practice of conservation planning—and broader spatial planning in general toward more consistently achieving efficient, equitable, and effective outcomes. 2013 National Academy of Sciences.